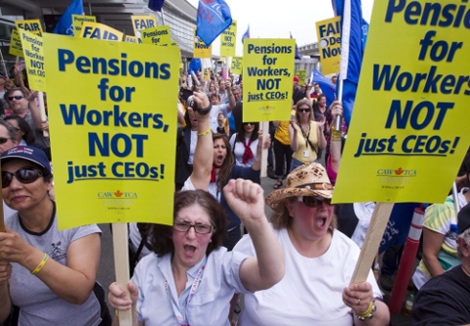 The attack on private sector pensions is not new; while the process has been uneven across time and sectors, private pensions in the U.S. and Canada have been eroding for over a quarter of a century. In 1980, some 40% of U.S. private sector workers and 35% in Canada had pension plans; today the number is under 20% in the U.S. and about 25% in Canada. At the same time, these pensions have steadily shifted from defined benefit plans (guaranteed pension levels) to defined contribution plans (essentially savings plans that provide indeterminate benefits, shifting the risk to workers). What is new is the self-assured aggressiveness of the corporate elite as they move to accelerate that erosion. The financial crisis – reinforced by the labour movement’s disappointingly weak response – has opened the door to the more assertive corporate attack on the pensions of their employees. Speaking to a recent gathering of the U.S. corporate elite to address “transformational change at a critical time in our nation’s history” and “define America’s future” (the heads of the Canadian Chamber of Commerce and the Canadian Council of Chief Executives were also present) a prominent U.S. leader offered a straightforward piece of advice: “Eliminate the entitlement mentality that is so pervasive in today’s American culture” (Ward’s Automotive, June 22, 2009; see also National Summit). At the same time, but narrowing its focus to pensions, The Economist , and one of global capital’s most prominent and influential magazines, provocatively lead with an editorial entitled ‘The End of Retirement.’ Referring back to Bismarck, the German Chancellor credited with introducing the first pension system in 1889, the London-based editors proclaimed that “Whether we like it or not we are going back to the pre-Bismarckian world where work had no formal stopping point.” (print edition June 25, 2009). It is hardly surprising that business recognized the current crisis as an opportunity to marginalize or end a benefit they’d come to view as a barrier to future success. 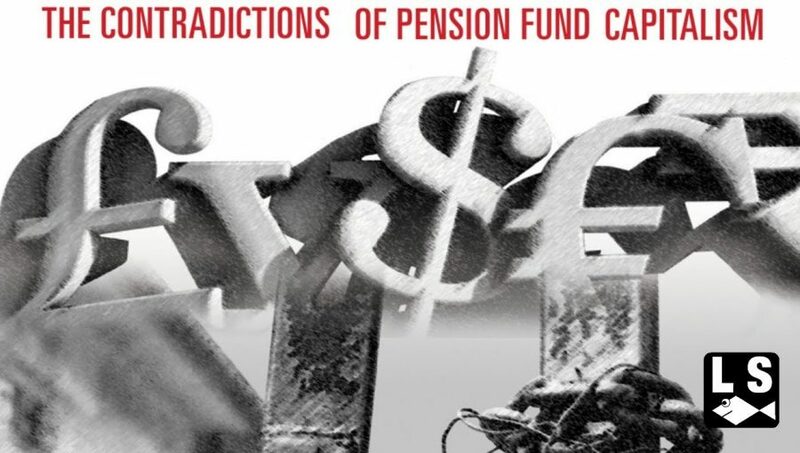 With growth expected to remain sluggish even after the economic crisis ends, and with returns on the monies put into pension funds expected to be low and uncertain – and so requiring more current funding to meet future obligations – worker pensions were all the more identified as an expensive ‘diversion’ from future investment and stockholder returns. But more than corporate tactics were involved. As the GM and Chrysler bankruptcies so dramatically highlighted – and business itself now readily admits – private sector pension plans suffer from a definitive contradiction: as an insurance plan, they depend on the survival of specific corporations while the world has changed so that even the viability of the largest corporations can no longer be taken for granted. Yet crises represent opportunities for labour as well as business. The difference lies in the extent to which the labour movement, unlike business, has (at least so far) failed to seize the opportunities raised by this crisis. Rather than building on the discrediting of the private sector’s ability to meet social needs and moving the arguement for a universal public pension, unions and workers have themselves absorbed the erosion of private pensions, accepting dramatic cutbacks including the exclusion of future workers. And faced with inferior pensions or no pensions at all, workers are increasingly themselves ‘choosing’ to solve the problem individually through, in the U.S., cashing in their 401(k) plans (their equivalent to Canadian Registered Retirement Savings Plans (RRSP)) in order to pay for health insurance when unemployment took that away or, in both the U.S. and Canada, working past 65. By letting business off the hook in this way, this has essentially eased the pressures for reform, made business all the more confident in its demands, and left public sector workers increasingly isolated and vulnerable to seeing their pensions cut as well. In this regard, it is crucial to emphasize that the prospect of a revised universal pension plan set at adequate levels is not a second-best option but the superior alternative. Unlike the private option, it offers universal coverage and thereby provides a foundation for the larger solidarity we need for all our struggles. The structure and levels of the benefits would depend on the vigour and priorities of the working class as a whole, not the strength or weakness of our separate employers. With pensions not dependent on particular employers, the threat of competiveness and unemployment would not be a vehicle for other concessions to save our pensions (or concessions in pensions themselves so as to not lose them entirely). And the social use of the substantive accumulated pensions funds, being in public hands, would be more open – though not automatically so – to democratic pressures. Among the questions this raises is that of the transition to a public plan. What happens to private plans in the interim? Do the workers covered by such plans just give up on the possibility of keeping their benefits? Or do they soldier on trying to hang on to what they can? Neither of these options gets to the heart of the problem – an appropriate economic and political transition to public pensions. This would have to include private sector workers joining – if not leading – the struggle for public pensions while fighting to hold employers to as much account as possible for their pension obligations so that corporations will themselves have some self-interest in socializing pension costs. (Another direction that takes us to a new integration of private and public plans, but may limit the goal of equality, would move corporate contributions into the more reliable existing public pension plan, the Canada Pension Plan. For an elaboration of this idea see Jim Reid, ‘Complicit, Complacent or Committed? Proposals to Build Pension Security for All Workers’, Bullet #203, April 16, 2009). One critical point raised by The Economist directly challenges public as well as private plans – the demographic implications of living longer. When the U.S. Social Security Act, providing for retirement at age 65 was passed almost three quarters of a century ago, life expectancy was 62. A good many workers would therefore never see retirement, and of those that did, they would likely get a pension for only a few years. So a public commitment to pensions seemed ‘practical.’ Today, however, with life expectancy in the early 80s, a person retiring at age 60 (after 40 years of work) would draw a pension for a period (20+ years) equal to almost half their working life. Is this still practical? Or is it now necessary to move to both increasing the retirement age substantially and reducing the annual pension income. This is a real dilemma and it requires choices to be made. But we should not be overwhelmed by the demographics. Alongside the increase in life expectancy since the 1930s has come a remarkable increase in productivity – real output per hour has increased some six-fold. The choices to be made do therefore not revolve around whether we’re rich enough to afford retirement, but the extent to which we value freedom from work over consumption, the form that freedom from work might take, and – above all – how society’s wealth is distributed (i.e. these issues can’t be abstracted from questions of power). In regards to the last point, whatever choices are made, a central principle must be that they do not become another vehicle for reinforcing inequality. A measure of equity should be introduced at least during the last years of people’s lives and this means structuring pensions so that pension levels would be heavily weighted toward a universal guarantee rather than being linked to income. Someone who lived their life in poverty with no income would get a pension of ¾ the average income rather than 15% of that average. Someone who had earned an average income would get a retirement income equal to their pre-retirement income. This would represent the maximum public pension (for a unionized worker who earned 50% above the average, this would mean a pension of two-thirds their former income). The funding of such a plan would be generated through progressive taxes – including wealth taxes to limit the reproduction of inequalities into future generations but also including taxes on all of us (this could not be financed by only taxing the rich). It may also be that we might prefer to move toward phased retirement rather than the abrupt change retirement has come to mean. For example, rather than retiring at 65, workers might go on shorter work time at age 60 – a 4 day week for three years then a three day week for two years, the time off partially supplemented by the pension fund – and thereby more gradually adjust themselves to a new life. A more fundamental question remains: if we are going to take time off equivalent to half our working life, should this be entirely concentrated at the end of our lives or should we take a significant portion of that paid time off during our working years? The case against putting it all into retirement – over and above the possibility of dying and losing the banked time – begins with the fact that to postpone all benefits until retirement is to essentially give up the struggle to change the everyday and greater part of our lives. There is something deeply disconcerting, if not tragic, about not sharing in the productivity of society during our youth and middle age in the hope of compensating for those lost years in old age (a version of suffering on earth for a reward in heaven). Moreover, that very trade-off weakens us collectively and so makes the possibility of decent future pensions less, not more likely. With workers accepting current degradations and families working such long hours, where will the self-respect and collective will – and the time – come from to generate the struggle for better pensions? And doesn’t the present moment warn that decent pensions, even where achieved, can’t be sustained absent struggles around a broad range of immediate issues? 1. Moving toward some internal consensus that the redistribution of work-time is a top priority for the labour movement – the next great arena for struggle and gains, and the kind of priority around which our movement can be rebuilt as a social movement. 2. Within that focus, we need to initiate the widest discussions around the relative merits of gaining greater access and flexibility over our work time during our working lives versus at the end of our lives (for many workers – such as part-timers – the problem may, however, be not enough work time and this adds to the importance of thinking in terms of the ‘redistribution’ of work time rather than just ‘fewer hours’). 3. Rather than waiting for the government to come up with some modifications in pensions, the labour movement – in consultation with its base and with other movements – should confidently frame and develop its own detailed alternative pension plan, including the age of retirement, early retirement options, pension levels, flexible options and funding (there is no shortage of progressive people with the skills to help with the technical aspects of such a proposal). 4. On this basis labour and its allies can initiate an educational and mobilizing campaign to ensure that no politician, nor business as a class, can ignore our issues. 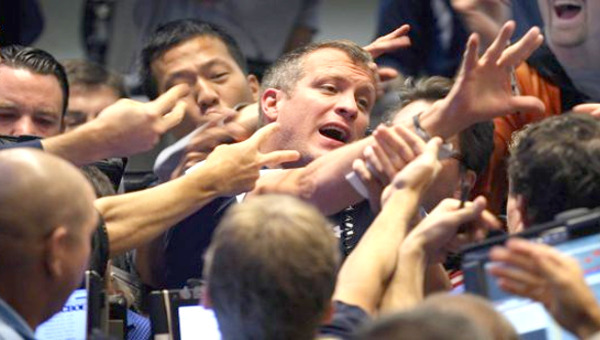 Red Eye interviews Sam Gindin: Pensions and the Economic Crisis.